Online e-commerce rakes in billions of dollars a year. Millions of products are being produced daily, but their methods have been questionable. Fair trade is a movement in applying a fair-working environment for workers to produce items and benefit from each sale. Problem is, that only a minute number of sellers sell fair trade goods and many of those sellers use a profiting business model. 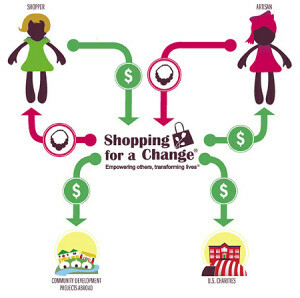 Shopping for a Change (SFAC) is a non-profit organization selling fair trade goods and further implements its non-profit business plans by donating profits to community projects and U.S. charities. Since its 2010 launch, SFAC tripled their sales and growth. The number of artisans rose from 11 to over 40, as it spans over 25 countries and helps over 25,000 people. SFAC employs volunteers to help make this into a true non-profit, fair trade goods store. What makes SFAC a unique non-profit site is the business model they use. The business model SFAC uses is simple. The organization looks to do three things with their business model. First, they want to make sure they help employ artisans in need and pay them a wage they deserve. Each artisan sets their own term to benefit from their work. Second, SFAC takes half of the profits from each sale and places it in community improvement projects SFAC is currently working on. Last, the other half of the profits goes to U.S. based charities shoppers get to choose. SFAC deploys a simple business model by looking to achieving three goals. The first step is to employ artisans in need and figure out a term to instantly benefit the artisans. Half of the profits made from each sale goes to a community project SFAC is currently working on. The other half goes to a U.S. charity the buyer chooses at checkout. Nothing goes to SFAC and in turn gives to those in need more. SFAC is using Indiegogo to collect further donations to reach out to more artisans in need and raising awareness through social media. The Indiegogo campaign creates transparency for SFAC’s non-profit model. Their straight, simplistic approach helps artisans, communities and other charities by focusing on how to distribute money and create better terms with current and future artisans. Fair trade goods may not welcome inexpensive products, but provides an ethical business model. SFAC takes that model and improves upon it by the delivery of donations to other charitable sectors. The only thing left for them to do is for everyone to come together for a great cause and help bring SFAC’s goal into a bigger spotlight. Contribute to SFAC’s Indiegogo campaign or just help spread the word.